The Shutdown: Democracy at Work? Republicans have driven the government past the point of rationality, complains Joe Nocera at the New York Times. "A government that functioned would fight over the budget, but would ultimately pass a budget. This government can barely hobble from one CR to the next." Michael Gerson at the Washington Post notes that the Tea Party's most vociferous opponents are now fellow Republicans, and it's gone beyond traditional GOP ideological disputes. "We are no longer seeing a revolt against Republican leadership," he observes. "This revolt is against anyone who accepts the constraints of political reality." The man who orchestrated the last shutdown, on the other hand, thinks Democrats are the ones being unreasonable "When President Barack Obama is willing to negotiate with Russian, Syrian, and Iranian leaders, but unwilling to negotiate with the US House … it is time for the House to stand firm," Newt Gingrich writes in a CNN op-ed. If Republicans cave, he argues, Obama will be able to bully them for years to come. Regardless of who's right, Sean Trende at RealClearPolitics thinks that politically, Republicans will suffer but survive. 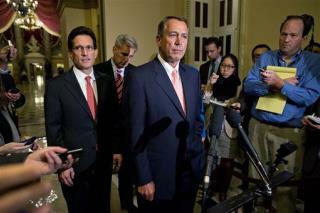 A shutdown will give Democrats ammunition to blame them for the next economic downturn. But their cause is more popular than Gingrich's was. "The prophesies of doom for Republicans are heavily overwrought." Give up ACA or the government gets it? Sorry GOP. We don't negotiate with terrorists.